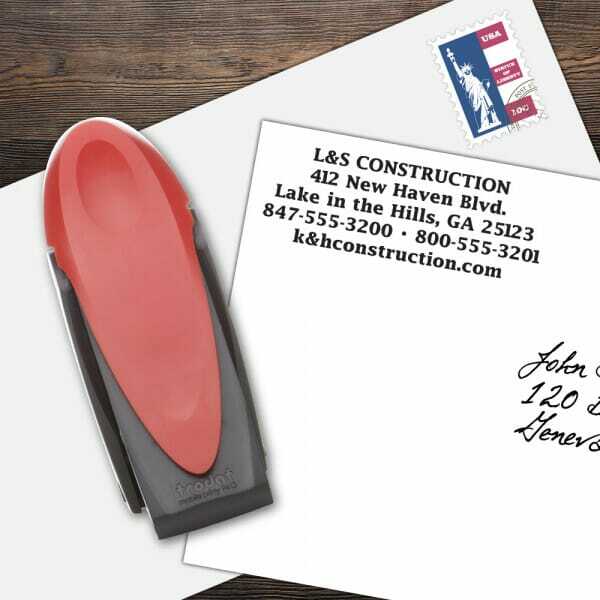 The Custom 5 Line Mobile Printy Name and Address Stamp is the perfect pocket stamp for users on the go! This stamp is a Trodat Mobile Printy 9413 self-inking pocket stamp which features a compact text plate size of 7/8 x 2-3/8" allowing for a standard 3 Line Name and Address plus 2 additional lines for email, phone number, or any other special message. The Trodat Mobile Printy works with a simple one-handed mechanism, and allows for a stable, crystal clear impression. It's perfect for use on an envelope or stationery paper. When you start running low on ink, simply order replacement cartridges. The replacement ink cartridge 6/9413 is available in black, blue, red, green or violet. Replacement pads are supplied in packs of three, and you can order yours today on Getstamps.com. Customer evaluation "Custom 5 Line Mobile Printy Name and Address Stamp"